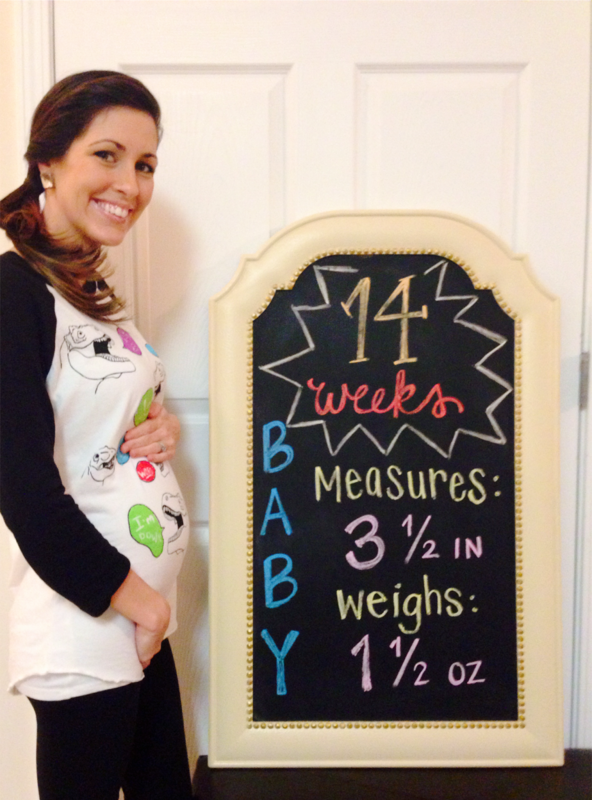 14 weeks and truckin’ along … I feel like from week 13 to 14 flew by! Part of me hopes it continues to fly by and the other part of me doesn’t want it to fly too fast because I want to enjoy it! 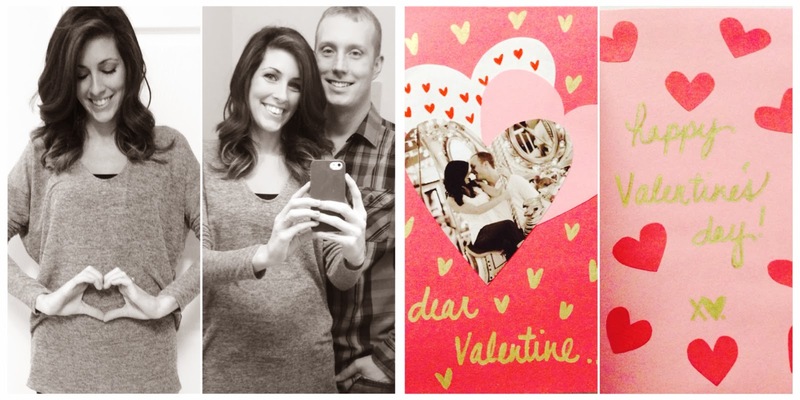 This week we went to the Doctor, celebrated Valentine’s Day, and did a little car shopping! We had a very eventful week so maybe that could be why this week felt like it went by faster than the others. Everything with the doctor went amazing! Baby’s little heartbeat sounded strong and healthy, Momma gained some more weight (the doctor was excited about that one), and we scheduled the Gender Ultrasound! Eeek! This week the baby measures about 3 1/2 inches and weighs about 1 1/2 ounces which doesn’t sound very big, but apparently in my tiny frame is huge because the belly has popped! Flowy shirts used to conceal the bump and now they hang on the bump making it a little more noticeable. I get a little nervous going out in public now because I see people staring and I hope they can come to the conclusion that I’m pregnant and not just a girl with severely poor posture. Some days I feel like it looks like a bump, and the other days I feel like it looks like I just have a gut and don’t know how to hold my stomach in this tiny little frame. I’ll be a bit happier to get out of this in-between stage. So, Valentine’s Day in our household isn’t as big of a holiday to us as it is to most people. We always try to celebrate with a nice dinner but with my birthday (March), my husband’s birthday (April), and our wedding anniversary (May) we try to save bigger gift giving for those days. This year my husband surprised me with Cupcakes, Cookies, Donut Holes, and a nice Hibachi dinner. Food was the way to my heart this year and he (*insert high-pitched singing tone*) NAILED IT! This little Momma and Baby were full and content the entire day! For him … I decided to make his Valentine. I got all my craft supplies and went all 5th grade on his Valentine’s card! It came out super cute! I knew I couldn’t find anything at the store that would say all the things I needed to say this year … so I made the card and wrote a nice long message inside … I think he may have shed a tear or two. Sssh! Don’t tell him I told you that! With the weather finally looking like spring we took full advantage of getting outside and spent some time at our local dealerships in search of a Mom car. I’m coming from a 2DR Coupe and always thought I’d want an SUV … but after test driving every SUV on my list of potential Mom cars I ended up falling in love with a 4DR Sedan. After assessing back seat sizes from infant to child, door angle ratio to see how far it opens to get a car seat in, to height ratio on leaning in to buckle, and finally trunk space for all of baby’s extras we then decided to take it for a test drive. We must’ve sat in the car for at least an hour going over every detail before we even took it off the lot for a drive … I’m sure the salesman thought I was nuts but that’s ok with me. It was definitely love at first drive and I’m positive the 4DR Sedan is the perfect fit for me and Baby B. I’m happy we took the time to test drive and decide now than when I have a big ole belly that will fit tightly behind a steering wheel! So, hang tight! I changed around some of the questions … again. I’m still learning all the things you can do with blogs and everything I want included in these weekly questionnaires! Enjoy y’all! Total weight gain? 3 lbs, considering my pre-pregnancy weight was below average my Doctor is pretty happy that the weight is coming on so easily and sticking, with that said, I mistakenly told him about my love for candy and I got the look of disapproval followed by “you need to make healthier choices.” Oops. Sorry, Doc. Meanwhile, my husband giggles with the “I told you so,” look. Pffft. Lost that battle. Maternity clothes? My regular clothes are hanging on by a thread … literally. Its only a matter of time. PEAK of the week? So many peaks this week! But I think my favorite would have to be at the Doctor’s office when he was looking for the heartbeat with the handheld Doppler … he couldn’t find it at first which was kind of scary but I told him I was pretty sure the baby was hanging out on the lower left side. My pregnancy has kind of been like a fish tank … you aren’t supposed to tap the glass but you do anyway to get the attention of the fish. Well, that’s my belly … you probably aren’t supposed to poke and prod but I can’t help but wonder if there really is a baby in there! During my investigation I was pretty sure I found the baby hanging out on the left side … I’m assuming I was right because as soon as the Doctor moved the Doppler we heard the strongest little heartbeat! PIT of the week? I would have to say driving off the car lot in the same car I drove onto it with. I knew we weren’t going to buy right away … our goal was simply to test drive and do some homework so when our bank’s spring auto promotion comes out we will look into buying then … but you can’t help but get new car fever! I’m just thankful we are in a position that will allow us to upgrade my car. Miss anything? I miss summer! After having weeks of freezing temperatures … this week is High 60’s/Low 70’s and it just makes me long for summer. I’m ready for summer dresses and my trusty old flops! Movement? While I can’t feel the baby move yet, my body is doing some moving. I’ve been having some serious round ligament pain and lower back pain into my hips … Hello, new hips and a round belly! Food cravings? Still have a sweet tooth which has proven hard to control! I’m trying to opt for fruit rather than candy. Anything making you feel sick or queasy? Pizza. I love pizza. It used to be like a main food group to me and right now it just does not settle well. I thought maybe it was just the brand, but after several different brand attempts they all make me feel icky. So pizza is out for now. Hmph. 🙁 This baby is slowly taking away all of my favorite things … he/she is just lucky they’re worth it. Gender? March 5th!!! Can’t get here fast enough! I’m trying to not even think about the gender so the next two weeks don’t iiiiiinch by … I can’t wait!! Symptoms? Fatigue! Most women are fatigued in their first trimester but my pregnancy has been anything but normal so why not wait until the 2nd trimester to be fatigued! I’m sure a lot has to do with broken sleep. Hopefully the next couple of weeks everything will even out. Belly button in or out? Still in-ish … like I said, its more flat than anything but it’s been than way my whole life. Milestones? Hearing a healthy heartbeat through the Doppler. Looking forward to? The gender reveal! T-Minus 15 days! Girl I feel you on all of this! I am a March baby too! We find out the gender a week from today and I cannot wait. And that dreaded car purchase needs to happen with us as well. Time to retire my 2 door accord as well!! Glad you're having a good week! Crazy! Same due date, March babies, and both coming from a 2 DR Accord … I have a feeling that if we didn't live on opposite ends of the country we could be great friends! Lol. I can't believe you find out in a week what you're having! So exciting! Can't wait to hear the news!